​June 1st saw the 2017 Essex Mark Provincial Grand Lodge take place, once again, at the picturesque setting of Felsted School. On a fine a sunny day, well over 300 Mark Masons from Essex and across the Country gathered together to attend the meeting and enjoy the festive board afterwards. Today was also to be a rather special day as the Deputy Grand Master and Pro Grand Master Elect, Right Worshipful Brother Raymond J. Smith along with the Grand Secretary Elect, Worshipful Brother Ryan Williams were in attendance as well as Right Worshipful Brother Stephen Davison, PastPGM for Leicestershire and Assistant Grand Master Elect. With Provincial Lodge opened, the Provincial Grand Master, R.W. Bro. Terence D. Sheern, formally welcomed our guests who numbered over 40 from other Provinces- a splendid attendance and a measure of the success of our province. ​both APGMs had agreed to stand down later this year and that he would be appointing two new APGMs at the September meeting of EIMM 1044. Those two new APGMs are to be Very Worshipful Brother Tony Latham and Worshipful Brother Mark Reeve. The announcement was greeted with acclaim both in recognition of the splendid support both the outgoing APGMs had given the Province over their combined 8 years of office and in congratulations to the two brethren to be invested. 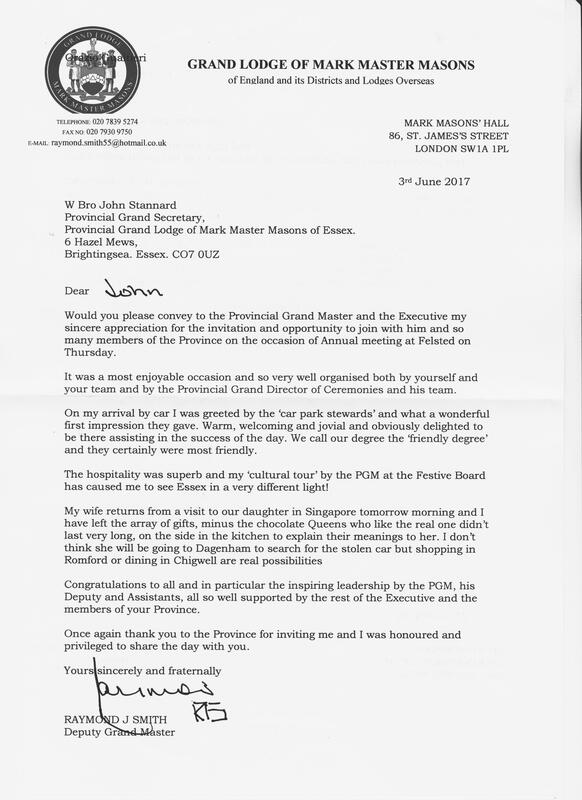 Of note, again, was the significant support in the number of displays and information stalls of other Orders meeting in Essex, not just those under the auspices of Mark Grand Lodge, but from Essex Craft and Royal Arch and all those that have an Essex footprint. By supporting and encouraging membership of other Orders we all ensure that Essex Freemasonry will flourish. ​ Many took the time to speak to the representatives of the Orders, ask questions and, in many cases, take away joining forms.